ABSTRACT. Immune complex deposition is associated with the accumulation of neutrophils, which play an important role in the various immune-mediated diseases. A novel anti-inflammatory agent, the lipoxin A (LXA) analogue (15-epi-16-(FPhO)-LXA-Me)), a stable synthetic analogue of aspirin-triggered 15-epi-lipoxin A4 (ATLa), was used in experimental anti–glomerular basement membrane (GBM) antibody nephritis in mice. ATLa was administered before the induction of the disease, and 2 h later, the animals were killed. ATLa reduced the infiltrating neutrophils and nitrotyrosine staining in glomeruli. Subsequent changes of gene expression in the early phase were evaluated, and 5674 genes were present under the basal conditions in kidneys from normal mice; 54 upregulated genes and 25 downregulated genes were detected in anti-GBM nephritis. Eighteen of these upregulated genes were those induced by IFN-γ. Real-time quantitative PCR analysis confirmed the results of the microarrays. To investigate a role of IFN-γ in neutrophil infiltration, anti-GBM nephritis was induced in IFN-γ knockout mice. The number of infiltrating neutrophils in these mice did not differ from those in wild-type mice. Also examined were CD11b expression on neutrophils from mice treated with ATLa by flow cytometry, but suppression of this adhesion molecule was not observed. Neutrophil infiltration was successfully inhibited by ATLa in the early phase of murine anti-GBM nephritis. 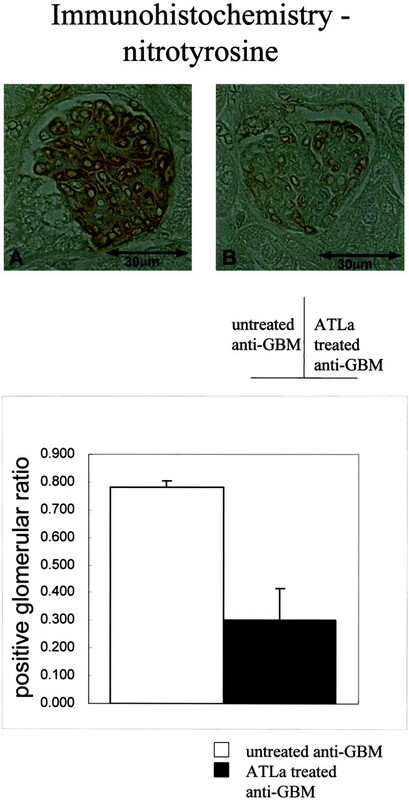 Microarray analysis detected the change of mRNA expression in anti-GBM nephritis and demonstrated amelioration of various genes by ATLa, which may provide a clue to the development of novel therapeutic approaches in immune renal injury. There is compelling evidence for a primary pathogenic role of immune complexes in many systemic immunologic diseases, including various forms of glomerulonephritis. Immune complex deposition is associated with the accumulation of neutrophils, which play an important role in the pathogenesis of immune-mediated disease. The interaction of neutrophils with immune complexes leads to phagocytosis, generation of a respiratory burst, degranulation, and leukotriene production. The animal model of anti–glomerular basement membrane (GBM) glomerulonephritis, induced by injection of heterologous antibody, is a widely studied experimental model for analyzing the pathogenic mechanisms of inflammatory kidney disease. This model is characterized by two phases of inflammation. In the early phase, called a heterologous phase, glomerulonephritis is induced by administered anti-GBM Ab. When the pathogenic “heterologous” antibody recognizes its antigen, the host complement system is activated, recruiting polymorphonuclear neutrophils. In the late phase, called an autologous phase, inflammation is caused by the immune response against the deposited foreign globulin. This phase is characterized by proteinuria and mononuclear cell infiltration (1). Renal injury in anti-GBM nephritis is traditionally attributed to the recruitment of neutrophils into glomeruli, although there are some situations in which neutrophil-independent mechanisms for injury operate (2). Neutrophil depletion by irradiation, cytotoxic drugs, or specific antibodies reduced glomerular injury in this model (3). Recent studies by Leech from Holdsworth’s group suggested that the modulatory effects of steroids in this model were on endothelial leukocyte adhesion molecules (4). More recently, Coxon et al. (5) revealed the role of Fcγ receptor IIIB in neutrophil recruitment in vitro and in vivo. Their result supported that the early neutrophil recruitment in anti-GBM nephritis was mediated by Fcγ receptor III through its interaction with immune complexes. Lipoxins are endogenous lipoxygenase-derived eicosanoids, generated during inflammatory, hypersensitivity, and vascular events. Lipoxins are formed principally by transcellular metabolism initiated by sequential oxygenation of arachidonic acid by either 15- and 5-lipoxygenases or 5- and 12-lipoxigenases (6). They have anti-inflammatory effects by inhibiting chemotaxis, adhesion, and migration of neutrophils across endothelium, and modulating several cytokine responses (7). Furthermore, recent reports have demonstrated stimulation of macrophage phagocytosis of apoptotic cells by lipoxins both in vivo (8) and in vitro (9) Intriguingly in the context of renal disease Lipoxins have been shown to modulate mesangial cell proliferation (10), an effect mediated by inhibition of receptor tyrosine kinase activity (11). Lipoxin A4 and its potential isomer lipoxin B4 are the two principal species formed in mammalian cells (12). However, the rapid metabolic degradation of native lipoxins by dehydrogenation at C15 and possibly omega-oxidation at C20 has prompted the design and synthesis of stable analogues, which retain many of the beneficial properties of the native lipoxin and demonstrate a prolonged half-life in vivo (13). In this study, we used a novel anti-inflammatory reagent, lipoxin A (LXA) 4 analogue (15-epi-16-(para-fluorophenoxy)-lipoxin A4 methyl ester (15-epi-16-(FPhO)-LXA-Me)) (14), a stable synthetic analogue of aspirin-triggered 15-epi-lipoxin A, in experimental anti-GBM nephritis. We evaluated the efficacy of this lipoxin analogue as well as subsequent changes of gene expression by GeneChip and real-time quantitative PCR analysis. C57Bl/6J mice were obtained from Saitama Experimental animal center (Saitama, Japan). IFN-γ–deficient mice were donated by Dr. Yoichiro Iwakura, Institute of Medical Science, University of Tokyo, Tokyo, Japan (15). For all experiments, we used 7- to 10-wk-old male animals weighing 20 g. Female Japan White rabbits weighing 2 kg were purchased to raise anti-GBM serum from Nippon Seibutsu Zairyo Center (Tokyo, Japan). The animals were kept in a standard animal house environment, and experiments were performed according to the Guide for Animal Experimentation (Faculty of Medicine, University of Tokyo). The anti-GBM serum was prepared as described previously (16). Briefly, rat glomeruli were isolated by differential sieving from the renal cortex and were disrupted by sonication. The GBM fraction was collected by centrifugation at 76,000 g for 60 min. Anti-GBM serum was raised in Japanese white rabbits by repeated immunization with purified rat GBM. For the immunization step, 1 mg GBM protein was emulsified with 1 ml complete Freund’s adjuvant (Difco Laboratories, Detroit, MI) and was administered to the rabbit by subcutaneous injection. Blood was collected by cardiac puncture from animals anesthetized with pentobarbital. Rabbit IgG was purified utilizing a caprylic acid precipitation method as described before (17). Briefly, after adjusting the pH of the serum to 5.5 with HCl, 5.5 ml/100 ml serum of caprylic acid solution (Sigma) was added dropwise with vigorous stirring. Then the solution was stirred for 1 h at room temperature and centrifuged at 14,000 rpm for 30 min at room temperature. The supernatant was collected and dialyzed against PBS. The dialyzed solution was centrifuged at 14,000 rpm for 30 min at 4°C. This supernatant was sterilized by filtration and stored at −80°C. Mice were immunized intraperitoneally with 0.5 mg of rabbit IgG (ICN, Irvine, CA) per 20 g body weight emulsified with CFA(Difco). Five days after immunization, the mice were administered 300 μg of rabbit anti-GBM IgG described above by retroorbitary venous injection. The 20 μg of ATLa (from Dr. H. Daniel Perez, Berlex Biosciences, Richmond, CA), aspirin-triggered 15-epi-lipoxin analogue, was administered intraperitoneally, four times in every 8 h until 6 h before the administration of anti-GBM rabbit IgG in the treated group. Two control groups, ATLa-administered mice without induction of anti-GBM nephritis (ATLa control) and normal control mice, were also examined. 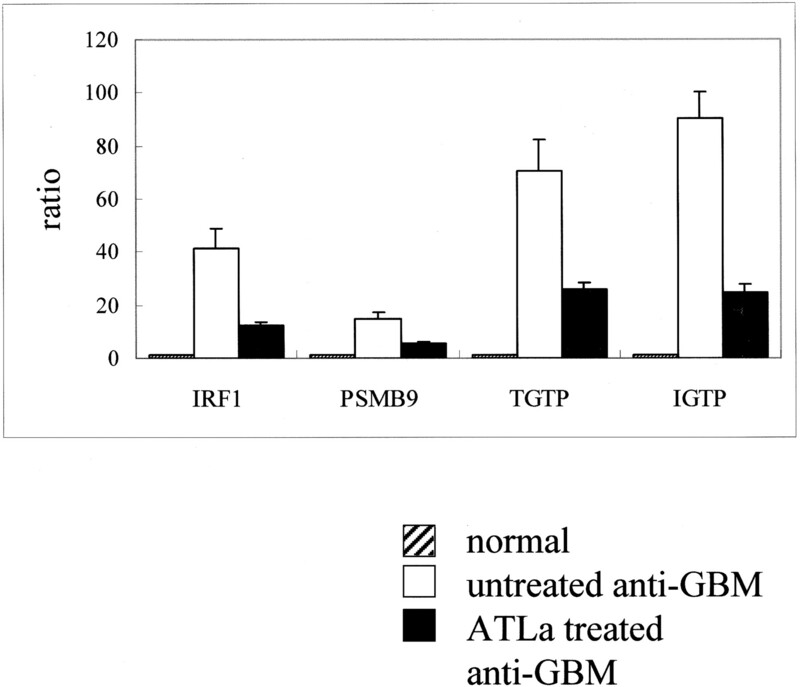 Anti-GBM mice treated with or without ATLa were killed 2 h after induction of the model, and ATLa control and normal control mice were also killed at the same time point. 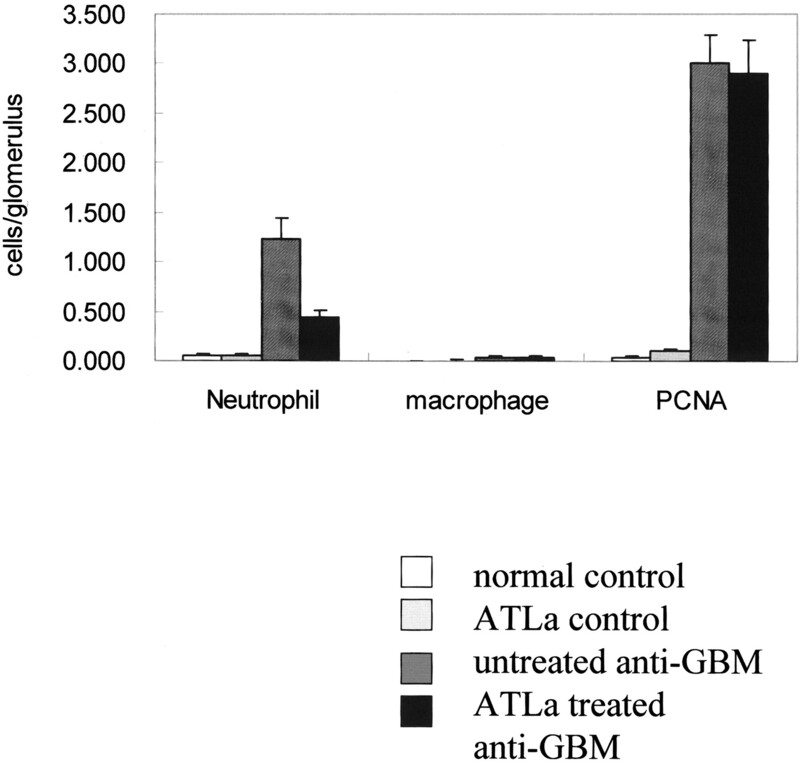 (ATLa-treated anti-GBM mice, n = 5, untreated anti-GBM mice, n = 5, ATLa control, n = 4, normal control mice, n = 4). After removal of the kidneys, they were fixed in Methyl Carnoy’s solution or were frozen in liquid nitrogen and stored at −80°C. The kidneys fixed in Methyl Carnoy’s were processed, and embedded in paraffin. Sections embedded in paraffin were cut at 4 μm thickness and stained with periodic acid–Schiff (PAS) reagent. Frozen sections were cut at 5 μm thickness. All light microscopic and immunohistochemical analyses were performed in a blinded fashion. Rat anti-mouse neutrophil Ab (Caltag Laboratories, Burlingame, CA), rat anti-F4/80 Ab (Caltag), mouse anti–proliferating cell nuclear antigen (PCNA) Ab (Dako) and mouse anti-nitrotyrosine Ab (Vector Laboratories, Burlingame, CA), were used for indirect immunohistochemical studies. Briefly, after 2 h of incubation at room temperature with the primary antibody, the sections were incubated with a biotinylated second antibody (anti-rat IgG Ab; Vector Laboratories) was used for neutrophil, F4/80, nitrotyrosine Ab, and anti-mouse IgG Ab (Vector) for PCNA Ab) for 1 h, followed by a 30-min incubation with a horseradish peroxidase avidin D (Vector). Color was developed by incubation with diaminobenzidine (Wako Pure Chemical Industries, Tokyo, Japan) and hydrogen peroxide and the sections were counterstained with methyl green (Vector). The number of positively stained cells per 30 glomeruli was counted. Nitrotyrosine was evaluated by the ratio of positively stained area in each glomerulus. If more than 50% of a glomerular area was positive for nitrotyrosine staining, the glomerulus was defined as positive. We counted the number of positively stained glomeruli out of randomly selected 30 glomeruli for each mouse. 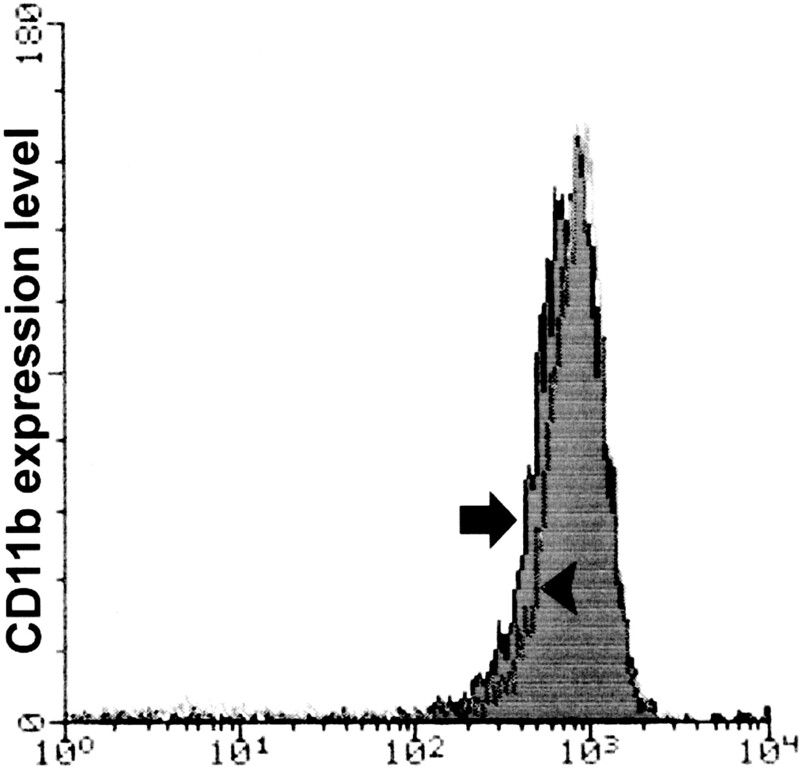 We used flow cytometric assays of whole blood to examine CD11b expression. Briefly, 100 μl of heparinized whole blood was lysed with ammonium chloride cell lysis buffer for 3 min at room temperature. Cells were then pelleted by centrifugation, washed twice with PBS, and resuspended in PBS. White blood cells were stained with a rat anti-mouse antibody to detect CD11b (clone M1/70.15; FITC conjugated; Caltag Laboratories, Burlingame, CA). Reactions were incubated for 45 min on ice in the dark. After incubation, cells were pelleted by centrifugation and washed twice with PBS. Stained cells were run on a FACScan (Becton Dickinson Immunocytometry Systems, San Jose, CA) flow cytometer. Neutrophils were gated by the forward and side scatter. The data analysis was performed by LYSIS II software (Becton Dickinson). Wild-type mice (n = 5) and IFN-γ–deficient mice were administered with anti-GBM Ab as described above, and 2 h later, kidneys were collected and fixed in methyl Carnoy’s solution to evaluate neutrophil infiltration. Total RNA was isolated by ISOGEN (Nippon Gene, Tokyo, Japan) according to the manufacturer’s protocol. The concentration of total RNA was determined at the optical density of 260 nm. A total of 12 μg of total RNA was annealed to the T7-(dt)24 primers. First-strand cDNA synthesis was completed by incubating the mixture with 2 μl of Superscript II RT (20,000 units) at 42°C for 1 h. Second-strand synthesis was carried out in a total volume of 150 μl. After purification, the cDNA pellet was precipitated with ammonium acetate and resuspended in RNAse-free water. Synthesis of cRNA was performed by in vitro transcription. The amplified cRNA was purified with an affinity resin column. The cRNA was fragmented and hybridized to the Affymetrix GeneChip Murine U74Av2 array (Santa Clara, Santa Clara, CA), permitting the assessment of the abundance of approximately 12,500 mRNA transcripts representing known genes and ESTs. Hybridization proceeded overnight. Subsequent washing and staining of the arrays was carried out with the Affymetrix GeneChip fluidics station protocol EukGE-WS2. After washing and staining, the probe arrays were scanned twice at 3 μm resolution with the Affymetrix GeneChip System confocal scanner. Data analysis was performed by Affymetrix GeneChip software. The criteria used to identify significant differential regulation of the transcripts was a greater than 2.0-fold change in expression in replicate experiments. After the analysis of GENE Chip data, we picked up four genes for further analysis. Interferon regulatory factor 1 (IRF1), proteosome subunit, beta type 9 (PSMB9), T cell–specific GTPase (TGTP), and IFN-γ–induced GTPase (IGTP) were assigned to quantitative real-time PCR. The primer was designed with the MacVector Software (Accelrys, San Diego, CA) based on the GenBank accession numbers. The designed primers were shown in Table 1.
cDNAs for real-time quantitative PCR were synthesized with total RNAs from kidneys. To avoid the contamination of genomic DNA, we treated total RNAs with DNaseI (Invitrogen, Carlsbad, CA). cDNA was then synthesized with oligo(dT) primer in a 20-μl reaction from 1 μg of total RNA with ImProm-II reverse transcription system (Promega, Madison, WI) according to the manufacturer’s protocol. One microliter of cDNA was added to SYBR Green PCR Master Mix (QIAGEN, Hilden, Germany) and subjected to PCR amplification (1 cycle at 95°C for 15 min, and 40 cycles at 94°C for 15 s, 55°C for 30 s, and 72°C for 30 s) in an iCycler system (Bio-Rad, Hercules, CA). β-Actin was used as an internal control. PCR was conducted in triplicate for each sample. All values were presented as means ± SEM. Statistical comparisons were analyzed with the program StatView (Abacus Concepts, Berkeley, CA) by the t test. A P value of less than 0.05 was considered statistically significant. We performed immunohistochemical analysis of the kidneys from anti-GBM nephritis mice. Three normal mice served as a control. In the early phase, neutrophil infiltration was clearly decreased in an ATLa-treated group (Figure 1). In contrast, we observed no significant changes in accumulation of macrophages in glomeruli (normal 0.000 ± 0.000, untreated anti-GBM group 0.033 ± 0.011, ATLa-treated anti-GBM group 0.033 ± 0.011 cells/glomerulus) or PCNA positive glomerular cells (normal control 0.033 ± 0.019, ATLa control, untreated anti-GBM mice 3.000 ± 0.289, ATLa-treated anti-GBM mice 2.907 ± 0.338) (Figures 2 and 3⇓). 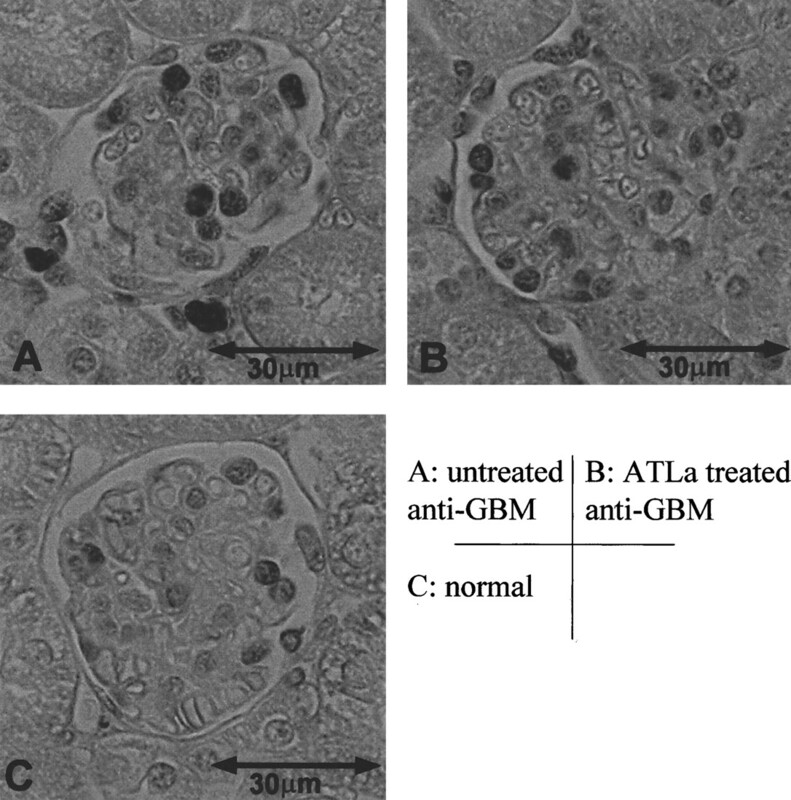 The number of nitrotyrosine positive glomeruli was significantly decreased by treatment (untreated anti-GBM mice 0.780 ± 0.024, ATLa-treated anti-GBM mice 0.300 ± 0.118, P < 0.005) (Figure 4). Figure 1. Immunohistochemical analysis of neutrophils in glomeruli of anti–glomerular basement membrane (GBM) mice 2 h after the injection of anti-GBM antibody. (A) Neutrophils infiltrated into glomeruli in untreated anti-GBM mice. (B) Significant decrease of neutrophil accumulation was observed in aspirin-triggered 15-epi-lipoxin A4 (ATLa)–treated anti-GBM mice. There was no neutrophil infiltration in ATLa-administered mice without induction of anti-GBM nephritis (ATLa control) (C) or normal control mice (D). Figure 2. Immunohistochemical analysis of proliferating cell nuclear antigen (PCNA) in glomeruli of anti–glomerular basement membrane (GBM) mice 2 h after the disease induction. There was no significant difference in the number of PCNA-positive cells between aspirin-triggered 15-epi-lipoxin A4 (ATLa)–treated anti-GBM group (B) and untreated group (A). Figure 3. Quantitative analysis of immunohistochemical study in the heterologous phase. A significant decrease of neutrophil accumulation was observed in aspirin-triggered 15-epi-lipoxin A4 (ATLa)–treated anti–glomerular basement membrane (GBM) group (P < 0.05). There was no significant change in macrophage infiltration or proliferating cell nuclear antigen (PCNA) staining. Figure 4. (a) Immunohistochemical analysis of nitrotyrosine in glomeruli of anti–glomerular basement membrane (GBM) mice 2 h after the disease induction. Untreated group (A) and aspirin-triggered 15-epi-lipoxin A4 (ATLa)–treated anti-GBM group (B). Positive staining was mainly observed along the glomerular capillary loops. (b) Quantitative analysis of nitrooxidative injury. If more than 50% of a glomerular area was positive for nitrotyrosine staining, the glomerulus was defined as positive. The percentage of positive glomeruli in 30 glomeruli was significantly different between the ATLa-treated anti-GBM group and the untreated group. To determine whether the effect of ATLa on neutrophil infiltration was a result of suppression of the adhesion molecule of neutrophil, we examined CD11b expression on peripheral neutrophils by flow cytometry of whole blood obtained from anti-GBM nephritis and ATLa administered anti-GBM nephritis mice. We did not observe any difference in the expression level of CD11b between anti-GBM nephritis mice and ATLa-treated anti-GBM nephritis mice, as shown in Figure 5. Figure 5. Flow cytometric profiles of peripheral blood neutrophils from anti–glomerular basement membrane (GBM) nephritis mice (arrow) and aspirin-triggered 15-epi-lipoxin A4 (ATLa)–treated anti-GBM nephritis mice (arrowhead). CD11b expression of peripheral neutrophils did not change by ATLa treatment. Neutrophils were collected 2 h after induction of anti-GBM nephritis. Because the effects of lipoxin treatment were observed in the early phase, we obtained mRNA from the kidney 2 h after administration of anti-GBM antibody. We chose this time point when we observed a decrease in neutrophil infiltration and associated protection from nitrooxidative stress by ATLa treatment. We also utilized mRNA from mice without disease, and compared gene expression profiles among normal mice, untreated anti-GBM mice, and lipoxin-treated anti-GBM animals. We observed expression of 5674 genes under the basal conditions of normal mice. Fifty-four genes were induced over 2.0-fold change in anti-GBM nephritis mice, and 25 genes were suppressed under 2.0-fold change in anti-GBM nephritis mice. Many genes suppressed by ATLa treatment were previously reported to be induced by IFN, and we defined these genes as IFN-regulated genes. The genes regulated by IFN and genes expressed in renal parenchymal tissue that were increased significantly in anti-GBM nephritis group are listed in Table 2. The changes of mRNA expression by ATLa treatment were also evaluated. The fold change values were also presented in Table 2. To confirm differential gene expression from gene chip data, real-time quantitative PCR was performed. We selected IRF1, IGTP and TGTP because they were markedly increased in anti-GBM nephritis and suppressed by ATLa treatment in our gene chip studies. In addition, IRF1 has been reported to function as a transcription activator of genes induced by IFN-α, -β, and -γ. IGTP and TGTP are representative genes of small G proteins induced by IFN-γ (Table 2). We also selected PSMB9, which was not detected in basal expression of normal mice, was increased in anti-GBM nephritis, and was significantly suppressed by ATLa treatment. PSMB9 has been reported to have a function as a subunit of immunoproteasome that selectively processes MHC class I-restricted antigens. The quantity of RNAs was evaluated as relative fold changes compared with normal control. Our quantitative PCR analysis showed essentially the same changes as those detected by gene chip analysis, as shown in Figure 6. Figure 6. Quantification of mRNA expression by real-time PCR analysis. Quantities of mRNA were corrected to the amount of β actin mRNA, and they were shown as relative ratios to the amount of the mRNA of normal mice. There was a significant difference between aspirin-triggered 15-epi-lipoxin A4 (ATLa)–treated anti–glomerular basement membrane (GBM) group and untreated group in all 4 genes (P < 0.005). IRF1, IFN regulatory factor 1; PSMB9, proteosome subunit beta type 9; TGTP, T cell–specific GTPase; IGTP, IFN-γ induced GTPase. Suppression of various IFN-inducible genes in our gene chip analysis stimulated us to study whether IFN-γ is directly responsible for reduction of neutrophil infiltration by ATLa treatment. To answer this question, we induced anti-GBM nephritis in genetically engineered IFN γ deficient mice. 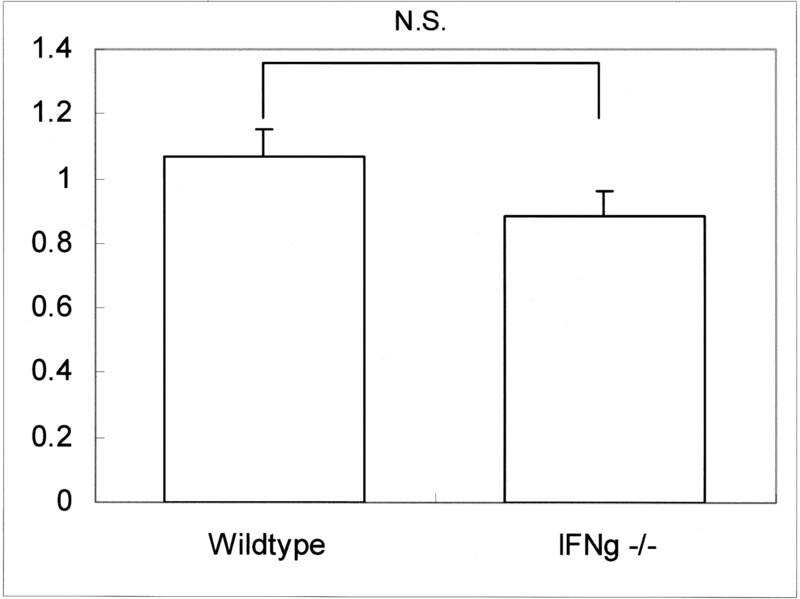 Our immunohistological analysis revealed no difference in neutrophil infiltration between wild-type and IFNγ deficient mice (Figure 7). Figure 7. Quantitative analysis of neutrophils in glomeruli of anti–glomerular basement membrane (GBM) mice 2 h after the injection of anti-GBM antibody. Our immunohistochemical studies showed no difference in neutrophil infiltration between wild-type and IFN-γ knockout mice. Native LXA4 and several synthetic lipoxin analogs have already been reported to have anti-inflammatory activity in experimental dermal inflammation, renal ischemic- reperfusion injury (18) and models of inflammation (19). Munger et al. (20) reported attenuation of anti-GBM nephritis with an increase in urinary LXA4 levels by in vivo transfection of 15-lipoxigenase gene, suggesting a direct anti-inflammatory role for 15-LO during immune-mediated glomerular injury. Here we demonstrated that the lipoxin analogue ATLa inhibited infiltration of neutrophils in glomeruli of anti-GBM nephritis mice in vivo. Accumulating evidence suggests that the mechanisms by which neutrophils mediate glomerular damage are primarily due to the release of oxidants and proteases. Poelstra and associates (21) demonstrated the presence of superoxide anion and hydrogen peroxide-generating leukocytes in anti-GBM nephritis. To study biologic consequences of amelioration of neutrophil infiltration by treatment with the lipoxin, we performed immunohistochemical analysis utilizing anti-nitrotyrosine antibody. Our results suggested that a decrease in the number of infiltrating neutrophils was associated with amelioration of oxidative stress in glomeruli. Recently Jozsef and associates (22) reported that ATLa reduced peroxynitrite formation in isolated human neutrophils, indicating a direct effect of ATLa on neutrophils. This direct effect may also be responsible for reduction of peroxynitrite production in our studies. We did not observe a difference in macrophage infiltration in glomeruli. This was not surprising because the heterologous phase is not characterized by macrophage infiltration, which is usually a feature on the later autologous phase of the disease. We measured urinary protein at four time points: day -3 (3 d before anti-GBM Ab administration), day 0 (8 to 24 h), day 3, and day 7. Urine was collected for 24 h except for day 0 (16 h). No significant difference in proteinuria (urine protein/Cre ratio) was found at any time points in ATLa-treated and ATLa nontreated anti-GBM nephritis mice (data not shown). However, these results were not unexpected. Feith and colleagues (23) reported that leukocytic neutral proteinase deficient mice (beige mutant, bg/bg) did not show a decrease of albuminuria in the late phase. Park et al. (24) demonstrated that proteinuria was comparable in the late phase between FCRγ knockout animals and wild-type animals. These results and ours indicate that inhibition of neutrophil infiltration in the early phase does not contribute to reduction of proteinuria. Lipoxin A4 is known to inhibit the expression of P-selectin on the surface of endothelial cells (25), and neutrophils cannot start “rolling” on or migrate between the endothelial cells. However, the expression level of P-selectin was below the detectable limit in our microarray analysis. We observed the marked changes in the mRNA levels of ICAM-1 or VCAM-1 in anti-GBM nephritis, but we observed that the LXA4 analogue did not suppress expression of these molecules. Fiore and Serhan (26) showed that LXA4 suppressed CD11b expression on the surface of neutrophils. Their report raised a possibility that the suppression of neutrophil infiltration in our model might be the result of the reduction of CD11b expression. Then we examined CD11b expression of peripheral neutrophils by flow cytometric analysis, but the change of CD11b expression was not observed. Our results indicate that the effect of ATLa was not mediated by CD11b reduction. Roles of these cell adhesion molecules in neutrophil infiltration into anti-GBM nephritis glomeruli are still controversial (27,28⇓), and it is possible that the effects of lipoxin in this model were mediated by other mechanisms (7). Neutrophils are recruited to inflammatory sites by cytokines such as growth-related oncogene protein-1 (GRO-1). Leonard from Brady’s group revealed that ATLa lowered the mRNA levels of inflammatory cytokines, IL-1β, IL-6 and GRO-1, in the mouse ischemia reperfusion model (18). It is possible that therapeutic mechanisms of ATLa administration in our experimental model included this aspect. Another possible mechanism of beneficial effects of ATLa administration is via renal hemodynamic changes, as LXA4 is reported to modulate renal hemodynamics (29). Previous reports suggested renoprotective effects of ATLa on vascular tone, PMN trafficking and epithelial integrity, which might contribute to our results. Some new effects of LXA4 and ATLa have also been reported by other groups. Qiu from Serhan’s group showed that ATLa upregulated transcriptional corepressor NAB1 in human neutrophils (30). Transcriptional factors involved in this upregulation of NAB1 gene have not yet been determined. This mRNA upregulation was observed in 60 min, so this reaction may contribute to an early effect of ATLa in our results. Our microarray analysis demonstrated downregulation of a variety of genes that are downstream of IFN-γ by lipoxin. In the 54 genes that increased more than twofold in anti-GBM nephritis, we found that at least 21 genes were induced by IFN. These results suggest involvement of IFN-γ in the pathogenesis of the early phase of anti-GBM nephritis. IFN-γ is a multi-potent cytokine produced by CD8+ T cells, CD4+ Th1 cells, and NK cells that activates macrophages, regulates isotype switching, and induces increased expression of MHC antigens. IFN-γ is crucial in a variety of so-called Th1-predominant diseases, including anti-GBM nephritis. Expression of INF-γ in the kidney was below detectable limits of our microarray analysis in both nontreated anti-GBM nephritis and treated animals. This may be explained by local infiltration of INF-γ producing cells, because we used the whole kidney as a source of mRNA for the microarray studies. Previous studies support a role of IFN-γ in anti-GBM nephritis. IFN-γ has been detected within the inflammatory cell infiltrate in autoimmune murine anti-GBM nephritis (31). Inhibition of Th1 cytokines (IFN-γ and IL-12) or administration of Th2 cytokines (IL-4 and IL-10) attenuates anti-GBM nephritis (32). Kitching and colleagues (33) demonstrated amelioration of nephrotoxic serum nephritis in IFN-γ deficient mice. IFN-γ production by both infiltrating cells and intrinsic renal cells was required to develop the full manifestations of the disease (34). Therefore, it should be beneficial to suppress INF-γ-regulated genes in Th1-predomnant diseases. A mechanism of changes of IFN-induced gene expression by LXA4 is a subject of the future studies. Although few reports are available on the effect of LXA4 on T cells, Ariel from Serhan’s group reported that ATLa blocked TNF α secretion from human T cells (35). This indicates a direct effect of LXA4 on T cells. In addition, Aliberti et al. (36) presented that a stable LXA4 analogue may modulate IFN-γ levels. Therefore, we used IFN-γ knockout mice to investigate an effect of ATLa on T cells and evaluated whether ATLa modulates neutrophil infiltration via IFN-γ–induced gene reduction (7). Our results showed that neutrophil infiltration in this early phase of anti-GBM nephritis model was not a direct consequence of the decrease of IFN-γ–induced genes expression. There are two possible interpretations on our results. One is that the reduction of neutrophil accumulation is responsible for the decrease of IFN-γ–induced gene expression, while the other is that neutrophil accumulation and IFN-γ–induced gene expression are independent phenomena. Neutrophil infiltration in the kidney results in nonspecific damage of the local tissues by production of superoxide and proteases. These nonspecific injuries in the kidney may have indirect effects on T cells with subsequent changes in IFN-γ production. So, we speculated that the suppression of neutrophil accumulation downregulated the IFN-γ–induced gene expression. In conclusion, we successfully inhibited neutrophil infiltration by ATLa in the early phase of murine anti-GBM nephritis. Our microarray analysis demonstrated amelioration of various genes by the lipoxin analogue, including 21 IFN-induced genes. Effects on IFN-induced genes by lipoxin may give a clue to development of novel therapeutic approaches in immune renal injury. This work was supported by Grants in Aid for Scientific Research from the Japanese Ministry of Health and Welfare (H13-21th century-17) and the Health Research Board Ireland (CG and NK) and The Welcome Trust (CG). We thank Drs. Toshio Miyata, Reiko Inagi, and Kiyoshi Kurokawa (Tokai University School of Medicine, Japan) and Dr. Hugh R. Brady (University College Dublin, Ireland) for helpful advice and generous support. Badr KF, DeBoer DK, Schwartzberg M, Serhan CN. Lipoxin A4 antagonizes cellular and in vivo actions of leukotriene D4 in rat glomerular mesangial cells: Evidence for competition at a common receptor. Proc Natl Acad Sci U S A 86: 3438–3442, 1989.